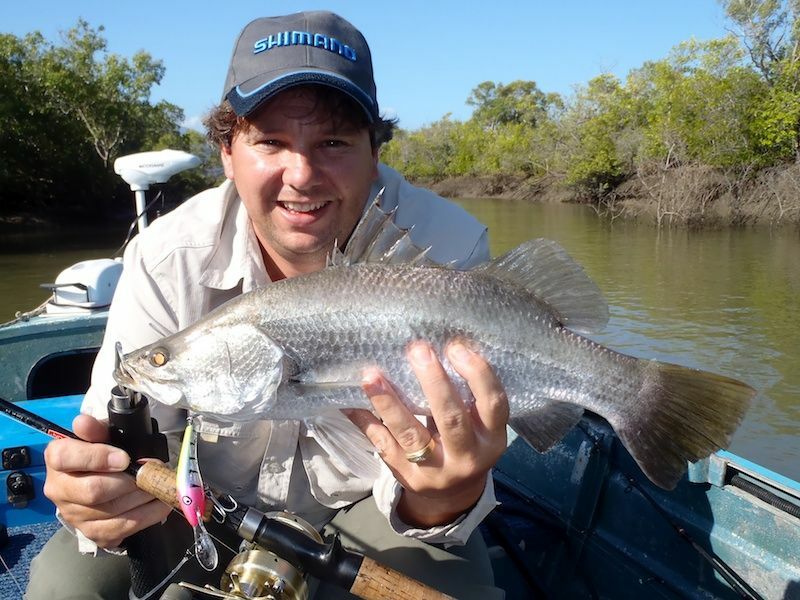 With the Barramundi closed season beginning midday Monday 1st November, yesterday was our last chance to have a go at these iconic fish. The tides are quite interesting this weekend, with a nice steady outgoing run in the morning, ideal for the creeks, and a bigger afternoon tide that suits chasing the big girls at the Cape. A quick chat with Mark in at ProTackle Friday afternoon confirmed my idea, so we decided to put in a full day on the water and give that a go. We put in at Cocoa about 5am and headed across to Crocky. The wind was light and the water was very clear, making it easy to find the channel out and across. The channel out of Cocoa is actually quite deep, but its very narrow and hard to stay inside of, and if the tide is low you have to head a fair way toward Magnetic Island before you can cut across. I don't have a GPS in the tinnie, but I do have an iPhone 4 with google maps. That really helped and the map is quite accurate. The water at the mouth of Crocky was stunning! Very clear and a beautiful colour. Despite it screaming 'fish here' we had planned to head further up, so we kept on going. A good 30min run up the creek and we got to an area that looked very fishy. Down went the electric and out came the lures. Water further up the creek was not as clean, but was good enough to give it a decent go. Things were typically quiet to begin with, and we were thinking this would be a poor end to the season for us. But suddenly a strike came completely out of the blue! We had worked this particular set of snags earlier in the morning convinced it should hold a fish. It was my first cast back in among the timber and I was about to say to Dad 'if there isn't a fish in there I'll eat my hat'. But I didn't get a chance. The Barra hit my Flatz Rat hard just as I bounced it off a hidden branch. This was a good fish and pulled 20lb braid off my Calcutta with ease. A couple of jumps and this was clearly a keeper fish. Some tense moments and the fish was in the net. At 63cm it was no monster, but good to have one finally landed. I pulled one more smaller fish from the same snag, and Dad was rolled by another bigger fish. But it all went quiet again from there. A little later in the morning I managed another small fish, but as the tide bottomed out we headed back toward the mouth to see what the wind was doing. By the time we got back to the front of Crocky the tide was rolling back in. The water was still spectacularly clear, so we tossed a few more lures around the mangroves. Despite finding huge schools of herring rolling around some of the snags, we couldn't find any Barra. We had a short stretch of the legs on one of the exposed sand bars before heading off to the cape for the afternoon session. It was a wet trip across, with the wind blowing quite hard off the starboard front quarter. But the protection of the cape meant we were only running across a slight wind chop. The plan was to troll some deep diving lures off the rocks at the cape until there was enough water to head into the mangroves. But I'm not real keen on trolling, and after a few passes and no hits we gave up and headed to long beach for a walk and to wait for the tide to come in. 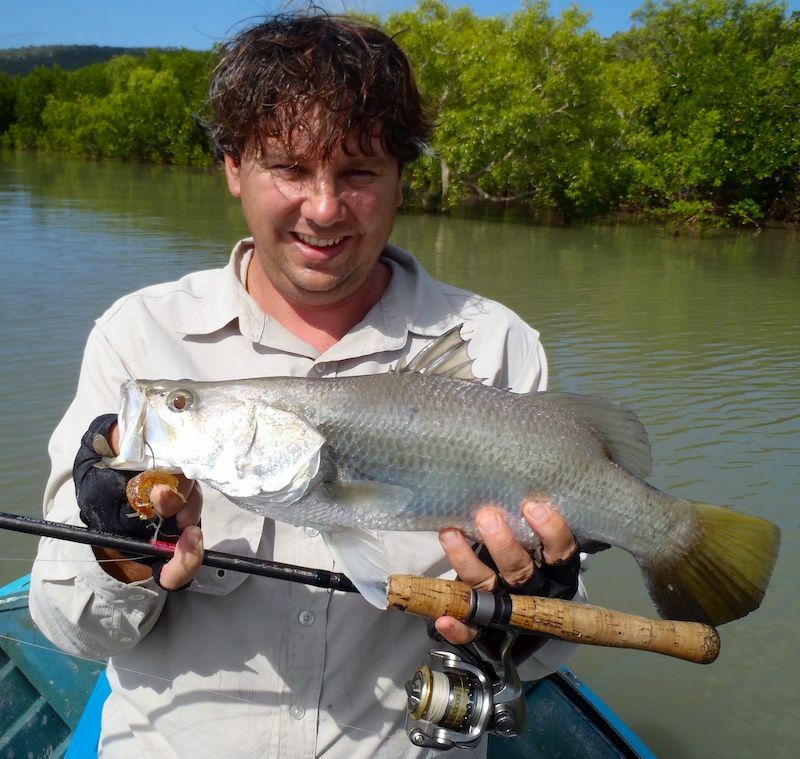 About 3.30 in the afternoon the water had covered enough of the mangroves to start fishing again. I decided to put the heavy gear away and fish some 3in prongs on a Sustain 1000 and 8lb braid. A dangerous idea, but a hell of a lot of fun! I had only made a few casts when a small Barra devoured the prong. He was a lively little fish, jumping all over the place. Despite the light gear he was easily led into the net. We worked the edge of the mangroves for the next 2 hours as the tide topped out and began to fall. However, despite lots off 'buffing' and bait crashing both among the mangroves and out the front, we didn't manage anything other than some flashes and rolls. We did, however, witness something I have never seen before. 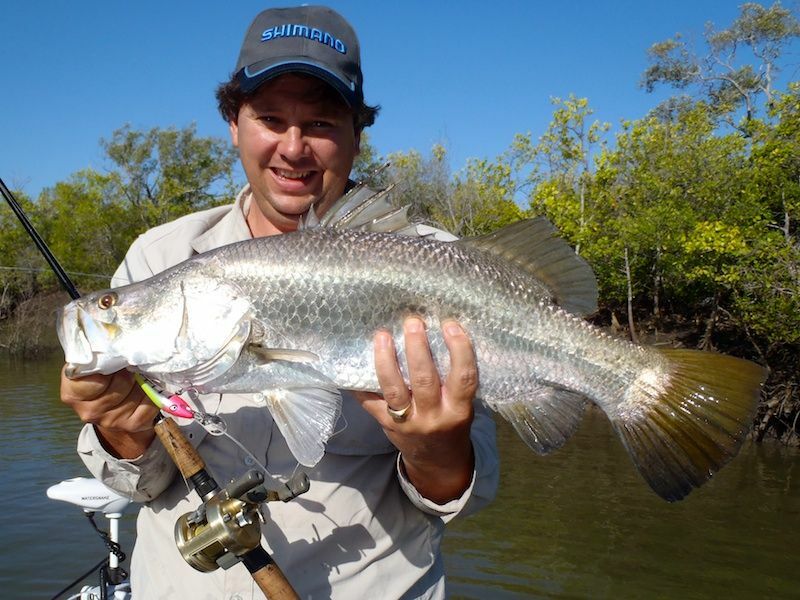 A small Barramundi get airborne out of the water chasing my prong as I lifted it to make another cast! He made a couple more jumps as he disappeared into the mangroves. Dad I just looked at each other! We also watch a turtle move among the timber that appeared to be munching on the mangrove leaving hanging in the water. Back into Cocoa at about 6.30pm the water was the best I have ever seen it! Very clear and a beautiful rich blue/green colour. Quite a few boats were still fishing around the mouth, obviously having their last go for the season. If you are lucky enough to be able to get in another fish before Midday Monday, good luck!